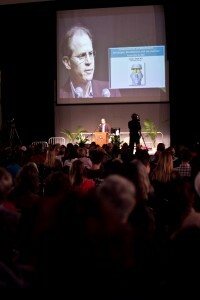 More than 1,200 people attended a conference on attachment theory and spirituality at EMU. 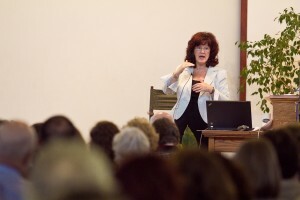 HARRISONBURG, VA. — “We have cracked the code of love,” announced Sue Johnson, EdD, author of Hold Me Tight, to 1,200 people attending “Conversations on Attachment – Integrating the Science of Love and Spirituality,” a three-day conference held at Eastern Mennonite University. Instead love is having an emotional bond with others with whom we form “a safe haven from the storms of life,” she said. Johnson and several other internationally recognized speakers at the conference stressed that this type of love actually enables us to live longer, with less pain and sickness. “Contact with a loving partner literally acts as a buffer against shock, stress, and pain,” Johnson said in Hold Me Tight. Conversely, “emotional isolation is a more dangerous health risk than smoking or high blood pressure,” she wrote, citing sociologist James House at the University of Michigan. 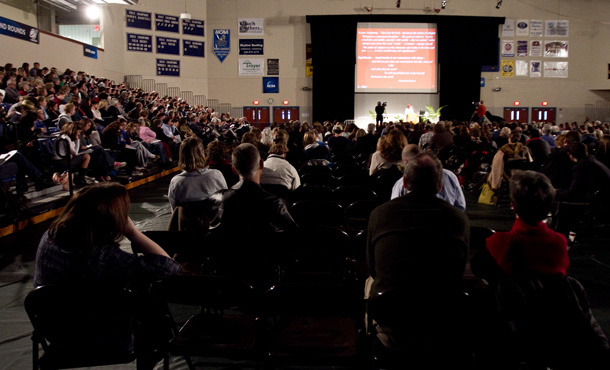 Of the five keynote speakers, Johnson and two others cited the results of several decades of research to support their assertions that caring relationships are as necessary to human life as air, food and water. The others referencing this research were neuroscientist James Coan, PhD, of the University of Virginia, and Dr. Daniel J. Siegel, a professor of psychiatry at the University of California-Los Angeles. “The brain is a social organ, and our relationships with one another are not a luxury but an essential nutrient for our survival,” wrote Siegel in his latest book, Mindsight – The New Science of Personal Transformation, to which he referred frequently in his presentation. Siegel also described how our minds work in synchronicity with those around us. Early added, however, “Community can also be harmful.” Strangers cannot betray us – it is those closest to us who can betray us, he noted. As a result, we must cultivate “habits of repair,” in order to heal harms that have been done, in addition to learning how to love healthily. The conference served to challenge the mythic image in the United States of strength being embodied in a lone individual making his or her way self-sufficiently through life, pretending not to need long-term, committed relationships. Conference organizers expected about 700 participants, mostly from EMU, but attendees from the community inflated the total to 1,200. Filling much of the University Commons arena, the audience included retirees, church personnel and health-care providers from the community (Rockingham Memorial Hospital was a co-sponsor). As the developer of Emotion Focused Couples Therapy (EFT), Johnson led a day-long, pre-conference training on EFT for 300 people in the mental health field. In the conference, Johnson, Coan and Siegel all made reference to the parent-child attachment studies begun after World War II by British psychologist John Bowlby. His Canadian assistant, Mary Ainsworth, continued this research through the 1990s, becoming a renowned psychologist in her own right. This research has now has been replicated and expanded by hundreds of other researchers; it demonstrates a child’s critical need for resonating with at least one caring adult in order to develop healthily. Brain images show relationships have an impact on brain activity. Using MRI imaging of the brain, Coan and other researchers have found that interpersonal relationships, particularly secure ones, have a measurable impact on brain activity. 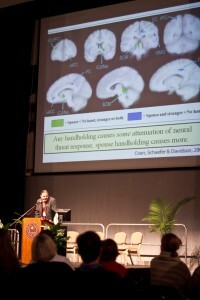 If someone feels threatened – resulting in a fight-flight-freeze response – this can be monitored via the “signal change” in his or her right amygdala, said Coan in his keynote speech. This signal increases to a high level when the threatened person is alone. The signal is attenuated by having a stranger present. It registers lowest – meaning, fewest signs of stress – when a partner is present. This new research by Coan and others is revolutionizing the field of psychology. It strongly suggests that humans are intended to live in relationship with others (that is, in families and communities), not as isolated individuals – in short, our brains function optimally when we have supportive relationships with others. Conversely, if someone feels socially rejected, it registers in the same part of the brain (the anterior cingulate cortex) as physical pain does, according to research cited in Siegel’s book. As he was wrapping up his presentation, Coan said with a smile, “I’ve never been invited to speak about spirituality at any conference, or about God.” In that respect, the EMU conference was “uncharted territory,” he added. Johnson told a reporter than when she was growing up in England, “my sense of spirituality got stuck in rules, dogma and dictums.” After Johnson included the words to a classic hymn “Abide with Me” in her presentation – noting that the words spoke of the need for attachment – EMU’s veteran choral conductor, Ken J. Nafizger, surprised Johnson by leading the audience in singing “Abide with Me.” She later said the singing touched her deeply, bringing tears to her eyes. The two other keynote speakers – John Paul Lederach, PhD, professor of international peacebuilding at the University of Notre Dame, and Nancey Murphy, PhD, professor of Christian philosophy at Fuller Theological Seminary in California – offered insights into building relationships to emerge from conflict situations (Lederach) and into the links between Christian theology and the findings explored at the conference (Murphy). The proceedings of the conference are to be edited for publication in the coming year. In the meantime, interested people can download PDFs of presenters’ PowerPoints at the conference follow-up page. Annmarie and Christian Early, a married couple with three young boys, conceived of the conference topic more than two years ago. 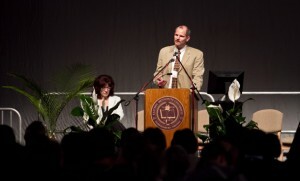 They were two of the four EMU professors and one staff member who spearheaded the conference. The others were biology professor Roman Miller, PhD, whose grant-writing yielded major funding from the John Templeton Foundation, and chemistry professor Tara L. Kishbaugh, PhD, who collaborated with Suter Science Center office coordinator Cheryl Doss in organizing the conference and ensuring that it ran smoothly.